XML Flash Slideshow v4 Testimonial: Compatible with EVERYTHING! I finally dedicated a chunk of time to get to learn the v4 software. All I can say is WOW!! And you guys made it so easy to create a slide show that is compatible with EVERYTHING. I am so grateful for your plugin!! I don’t learn easily from reading manuals, so I have to play with it enough until the concepts and interface sinks in. You guys rock!!! . . . Best dollars I EVER spent. Steven expresses what most XML Flash Slideshow Creator v4 customers say about the tool – the more they know it, the more they love it! XML Flash Slideshow v4 Testimonial: Amazing & Fantastic! Amazing! After searching high and low for a product that could handle mixed media, custom formats for layout and work on a touch screen device, this does it. Fantastic, quick, to-your-needs customer support, really great. Experience the XML Flash Slideshow Creator v4 today – support for building customized layouts, mixing photos, audio and video, touchscreen support, great support, and more! 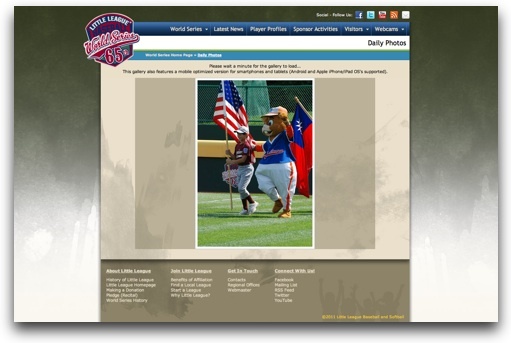 Little League Baseball used the XML Flash Slideshow Creator v4 in 2011 to display daily photos from the Little League World Series. Update August 2012: The LLWS site has been updated and this page is not longer available. XML Flash Slideshow Testimonial: Extraordinary Support! I already liked XFS3, but XFS4 makes some steps easier and it offers more features and is easier to use. What I LOVE the most about this slideshow, however, is the absolutely extraordinary support! I had questions on several occasions which they always answered [with] fast, competent, and very friendly [answers]. It is near to impossible to find that quality of support today – thanks a lot! 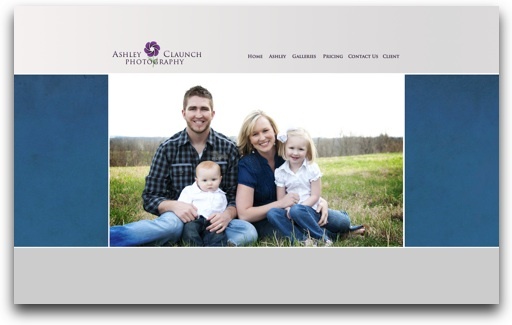 XML Flash Slideshow Testimonial: Intuitive interface, Great templates! Within an hour I had great looking slide shows embedded in my web site. Intuitive interface – I upgraded immediately. Great templates! As far as the XFS v4 product, I would say that it is probably the best (and cheapest) product I have bought for web design. My knowledge and understanding of programming is limited, but the features that this program offers and the relative ease in learning them has opened so many design possibilities. Even my husband was amazed when after 10 minutes of owning the program I had accomplished what had previously taken hours. In addition to the product, I have never experienced such wonderful customer service. On numerous occasions, I have asked very specific questions and received very specific answers. I almost felt as if I had a guide helping me design my website rather than someone just telling me what the product can do and referring me to a manual. I would have absolutely no hesitation in recommending this product to anyone! GREAT product and easy to use. It builds slide shows and much more effortlessly. The available transition effects and templates are beautiful. VERY much worth the money. XML Flash Slideshow Testimonial: Great v4 Improvements! So much quicker and more user friendly than v3, I love it! The customer service that you receive from DWUser.com is unlike any other software company. The response time is incredibly fast and the answers are always extremely helpful. I have been able to do great things with your DW plugins thanks to your support after the sale. I got it working thanks to your help. You are absolutely amazing! I love using your program but a good program is only as good as it’s support. You exceed expectations and make the program even more valuable with your very professional care and quick response in giving your support. Please feel free to use this as a [testimonial] of your excellence!